For many children with disabilities, the joy of riding a bicycle with friends and family can remain out of reach. Variety - The Children's Charity is working to change that. 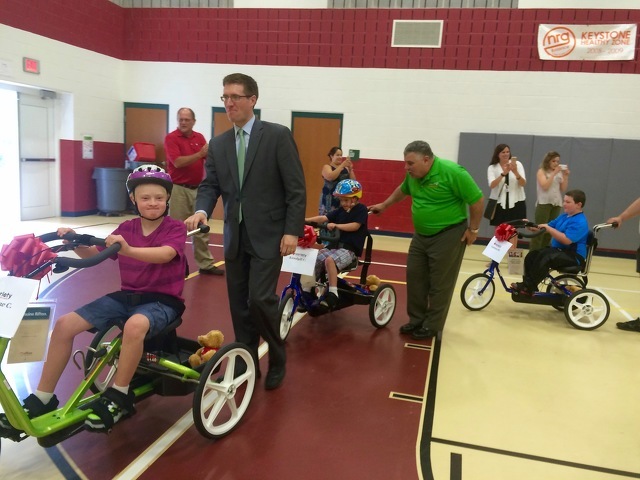 On Wednesday, Variety's Wexford, Pa.-based chapter presented 10 adaptive bikes to children from State College Area School District, Bald Eagle Area and Clearfield during an event at Park Forest Elementary School. "This is huge for the kids," said Sharon Salter, State College Area's director of Special Education. "It’s life-changing not only for the kids but also for the families, especially a family that likes to be out with their kids, likes to be outside. They don’t ever have to worry bout two wheels, they can just do this." Salter led kids on their new bikes in a parade around the Park Forest gym on Wednesday after an introduction by Variety CEO Charlie LaVallee. LaVallee said that to date, more than 1,100 adaptive bikes have been donated -- about $2 million worth of bicycles that normally cost about $1,800, a steep price for the average family. The program has expanded to 50 Pennsylvania counties. Variety's "My Bike" program is also matched by a "My Voice" program providing iPads for kids in need of a communication device, and "My Stroller," which provides an adaptive stroller that allows for easier mobility. The program came to the attention of Salter and the district from Jim Fogleman, head custodian for the Delta Program and president of the Association of Federal, State, County and Municipal Employees (AFSCME) for State College Area. AFSCME has been a long-time supporter of Variety. "When he heard about this, Jim came to me and said let’s get hooked up with this and get this happening," Salter said. From their, Salter met with Variety representatives and provided information on how to apply to the families of children with disabilities. District physical therapist Adrienne Fee then measured kids for the bicycles. Salter hopes to see more area families be able to use the program. "We’re hoping to expand this and other families will realize they can do this. I hope it continues," she said. "I’m seeing this and thinking of other kids in our district who would benefit from accessing this. It’s a gift for these kids, to be able to do something very typical that most kids get to do growing up." Mickey Sguro, a Variety board member and regional AFSCME director, said the program helps kids have a chance to do what they enjoy. "This program is incredible," Sguro said. "The reason I am so passionate about this and I got involved is, what does a child want? A child wants parents or relatives or schoolmates to be proud of him or her, and they want a chance. Too many times these children don’t get that chance. A lot of these kids will sit on the porch and watch people ride by -- their classmates and brothers and sisters -- and they sit there and all they want is that opportunity to show their parents they can do it. "Every child deserves this chance." 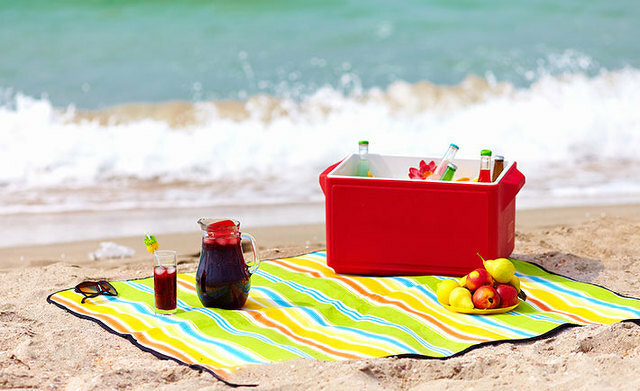 There are a few things you need to consider when you are getting ready to spend a day at the beach. One thing, for sure, is that there will be sand everywhere — and I mean everywhere. Not to mention that you'll be taking some of that sand home with you.